This is the first Clovis artifact identified to have ancient adhesive preserved within the hafting area. It was found several years ago by John Dyck on the Hoyt site in the Great Basin region of Central Oregon. It's most important feature is the abrasion scratches located on both sides on the channel flake scars. Lab analysis by Kenneth B. Tankersley revealed the presence of an organic hafting adhesive (mastic) in the striations. Chemical and microscopic analysis identified the material as amber resin along with possible particulate wood charcoal inclusions. This is the first documentation of a Clovis point that has it's original hafting adhesive preserved on the channel flake scars. It's not uncommon to find Clovis points made of Obsidian that have striations on the basal channel flake scars. It's believed the striations were added to the hafting element on Obsidian because the newly fractured surface of Obsidian is very smooth. The additional surface roughness gives the hafting resin extra holding or gripping qualities. 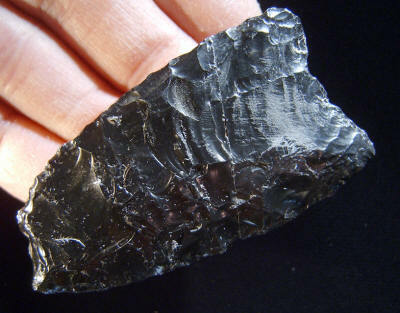 Obsidian was one of the softest materials used to make Clovis points. Obsidian has a Mohs scale hardness of between 6.0 and 6.5. Chert, Chalcedony, quartz crystal and orthoquartzie have a hardness of 7.0. The Hoyt site was a habitation and stone tool manufacturing site. Several Clovis artifacts and waste flakes were surface collected on this site over a period of several years. This Clovis point has impact damage to the point. It's made of black opaque Obsidian and measures 2 5/8 inches (6.7 cm) long and 1 3/8 (3.5 cm) wide.